Too many times firefighters come upon a car wreck where the parent is unconscious, and there are children in the car too young to speak or communicate anything useful to the rescue team. 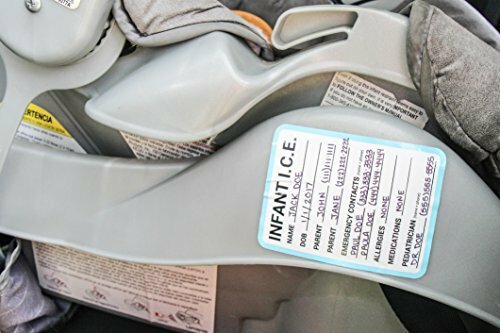 Place a car seat sticker (or use a luggage tag or self-laminating kit to make it last longer) on each child's car seat providing information to help rescuers. Include: Your child's name and date of birth, parent's names, date of birth, work and home phone numbers, emergency contact information, child's doctor, an up-to-date picture of your child. Include any allergies your child has – especially to medications – and if there is any medical history emergency workers need to be aware of or will make their job easier, such as if your child is diabetic, autistic, has a history of seizures, etc. 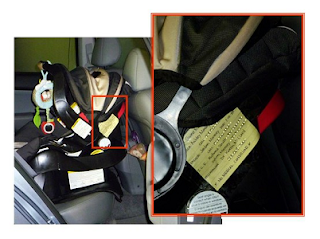 Place the sticker on an out-of-the-way place on baby's car seat, where it can't been easily seen by passersby, placing it on the stationary part of the car seat you leave inside the car. You should also attach one sticker on booster seats or seat belts, as well as diaper bags, strollers, backpacks, luggage - anywhere you need important information stored for your child.